Why do people download your app? Did you ever wonder why do people actually download your app? A recent study from Forrester Research provides the key elements to understand how the apps gain traction on the Store. According to the study, 63% of iPhone owners download apps while browsing on the App Store. For such reasons, ASO remains the best way to gain traction. Keywords, description, screenshots need to be polished if you want your app to come first when people are spelling some keywords on the Store, or looking for your app. 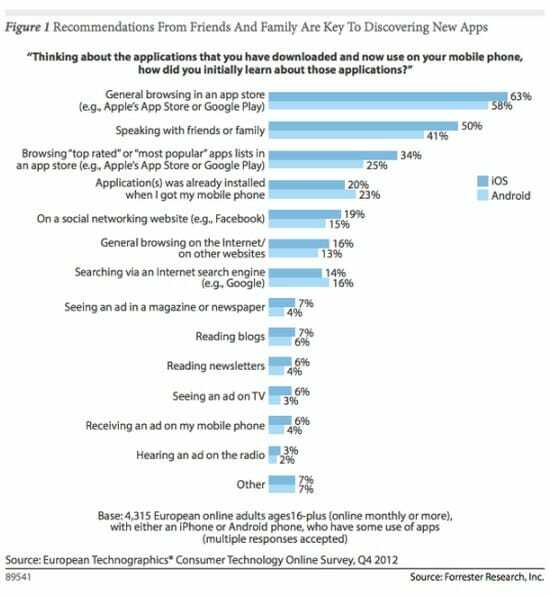 Approximately 34% of the users also download an app while browsing through the top rated and most popular apps. This is the reason why it is essential to know how the App Store actually works and how you can get traction to hit the top spot. And when I say top spot, I mean the 50 most popular apps. Do not expect regular users to go any further. Browsing through the Store is quite boring, and people do not usually browse more than a few minutes. Gaining vibisility with the right keywords will improve your chances to have your app downloaded. If your app seems to be attractive, you will convert a huge amount of visitors into buyers and get better rankings. Underestimating the impact of a good ranking would be a huge mistake. While people browse through the most popular apps, they do expect to find the best applications, and are ready to download pretty much everything. They might give your app a try, whether they are interested or not. 75% of the users download apps without having heard of them, simply because they find these apps among the most downloaded apps. People like to talk about their smartphones, tablets and how they basically use these gadgets in their everyday life. 50% of iPhone users download an app because one of their friends told them to do so. Yes, you heard it right, 50%. Having a great reputation is essential if you want to hit the top spot. Though, do not forget the role of ASO. While looking for your app on the Store, people expect to find your app at the top of the list. Having the right keywords and an explicit app name can help. Being inventive, using synonyms and different keywords from your competitors is a plus. Alright, this time, ASO canno’t really help you. People use the social networks as a RSS feed nowadays. If they are heavy users, they will follow various tech blogs to get the last updates about their favourite devices or new apps. Having a dedicated page for your app on Facebook and Twitter, and a couple of articles in the press will help you to create the buzz on the Internet. Don’t be lazy, it’s simple as hell, and it’s free of charge! Here we go again. ASO. SEO. You’ve got it. 16% of iPhone buyers download apps after checking various websites, and 14% use search engines to find new apps. ASO and SEO will ensure your app gets regular amount of viewers from all over the Web. These users usually have no idea of what your application is about. This is why it is essential to have the right description and the right screenshots. Try to show the best aspects of your app, use bulletpoints, try to make your app compatible with as many devices as possible. As proofreading is essential for businesses, think about checking everything before publishing anything. ASO provides the right tools to constantly improve the visibility of your app, but also its rating. Users can even provide additional reasons for viewers to download your app. A positive review can have a real impact on the opinion of a viewer. Managing these reviews is also a part of the process. Less than 7% of the users admit downloading an app right after reading a positive opinion on a blog, in the press or seeing an ad in a magazine or on TV. Nah, can’t be? What did you think? Actually, you and your friends are not “regular people”. Most of the people do not read the newspaper and only geeks regularly check the latest news on the tech blogs. For such reasons, the impact of ads & media coverage remains “limited”. Right, there is something more. If you want users to pay to download your app, you’d better think about the media coverage. People checking regularly tech blogs and newspapers are more inclined to pay a few bucks for an application than regular people you meet in the streets. Though, do not forget this remains a “niche market”. Etienne Froment is a freelance journalist passionate about new technologies, apps, mobile marketing and startups.